Moving files on and off your iPad with iTunes is fun and all, but what if you also want to exchange files with your iPhone or move files around on the device with your Windows PC? 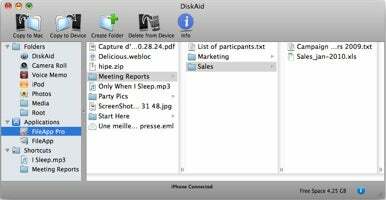 DiskAid 4.0 from DigiDNA may be a cross-platform i-file manager option for you. Announced on Thursday, DiskAid 4.0 is basically the File Sharing panel of iTunes’s Apps tab, baked into a separate application with a few surprises sprinkled in for good measure. This new version can shake hands with file-management apps such as AirSharing Pro, FileMagnet, and DigiDNA's own FileApp on iPhones running OS 3.1.3 and the iPad running iPhone OS 3.2,. Also new is support for iPhone OS 4.0 and automatic discovery of iPhone or iPad apps that can store files. You can now select multiple files or folders and even move them from one directory to another on an iPhone, iPod touch, or iPad. DiskAid is available for Mac OS X (Universal, requires 10.5 Leopard or 10.6 Snow Leopard) and Windows (XP, Vista, 7), and you can give it a whirl with a free trial. A cross-platform license that covers three computers (both Mac and PC) is $10.